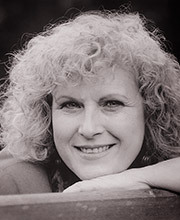 Melinda Walker has performed in countless radio plays and theatre nationally. As well as narrating TV documentaries, she was the voice of the daily quiz show 100% Gold. She devises and performs poetry and song events, and read in a commemorative edition of Radio 4’s Something Understood for the Princess of Wales. Melinda writes for the theatre with her husband.